Technology has made it much easier to instantly understand your complete financial picture, but apps and online banking alone can't help people get motivated to create and maintain a monthly budget. As part of the POPSUGAR Insights 2017 Personal Finance Report, we surveyed nearly 2,000 women between the ages of 18 and 44 to ask them how they manage their finances and think about their financial future. Overall, women under the age of 30 are 14% less likely to say they maintain a budget but know how much they spend and 14% more likely to admit they do not keep a budget at all. 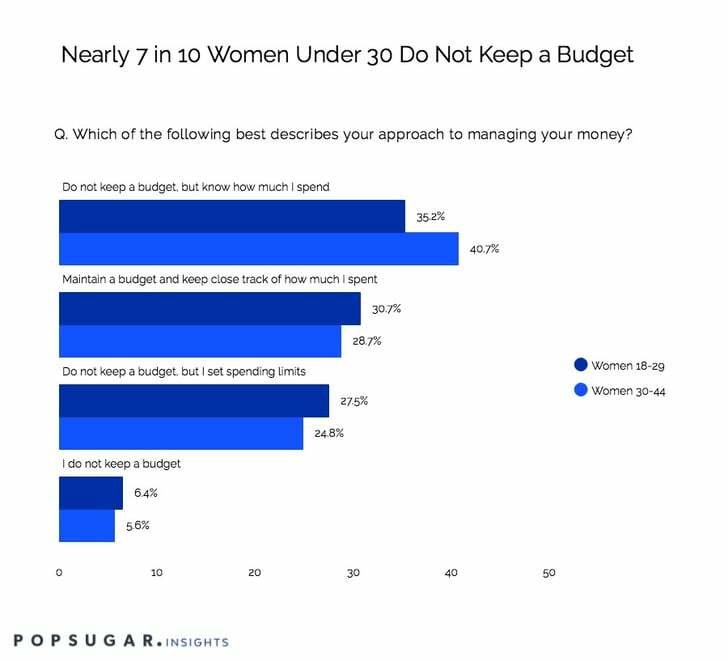 While less than 10% of women admit that they don't keep a budget or track their spending at all, 62% of women under the age of 30 say they do not keep a budget but either set spending limits or have an idea of what they spend. Women under the age of 30 are 10% more likely to set spending limits, while women between the ages of 30 and 44 are 16% more likely to say they know how much they spend. Women under the age of 30 are slightly more likely to maintain a budget and keep close track of how much they spend, but less than one-third of women overall maintain a budget. Maintaining a budget is an important way to properly manage your finances, but women sometimes lack the knowledge to get started, the tools to help them create and maintain their budget, or the inspiration to stay on top of their daily spending habits. Marketers can help buy focusing on identifying the consumer need, and then creating content that focuses on offering information or inspiration to help them get started and stay on track.